Have a free condom. Avoid buying a country house. 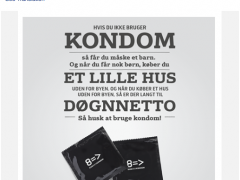 That’s the message from Danish retailers DøgnNetto and qUINT and qUINTESS. Svensk Handel, the Swedish trade association, is going on election tour in Sweden and will visit nine mid-size cities putting local politicians in the hot seat.